ARABICA COFFEE SEED OIL 100% Natural 4 Fl.oz- 120 ml. ARABICA COFFEE SEED OIL, 100% Pure/ Natural. For Face, Body And Hair. Wrinkle Reducer, Anti- Puffiness / Dark Circles, Anti Cellulite. 4 Fl.oz- 120 ml. 100 % Pure,100% natural, Chemical Free, A Little Goes a Long Way, Absorbs Quickly, It's not greasy. For all skin types, also for dry/flaky, sensitive and mature skin types. Improves elasticity, encourages regeneration of skin cells. Helps restore skin's own elasticity and tone. Used topically for Eczema, Psoriasis, Cellulite, Acne and other skin conditions.For Dry, Brittle and Damaged Hair. Lip Care. Arabica Coffee Seed Oil Roasted possesses a remarkable ability to nourish, moisturize and improve skin elasticity, improves skin tone and gives your skin a healthy glow. it also balances pH and after application the skin usually feels soft and smooth. 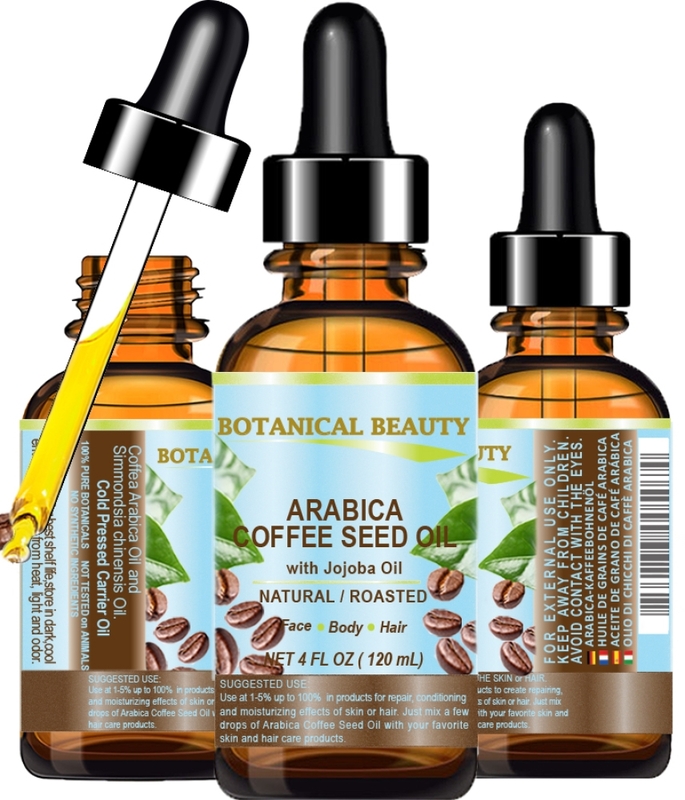 Botanical Beauty Arabica Coffee Seed Oil Roasted used on face, dody and hair. 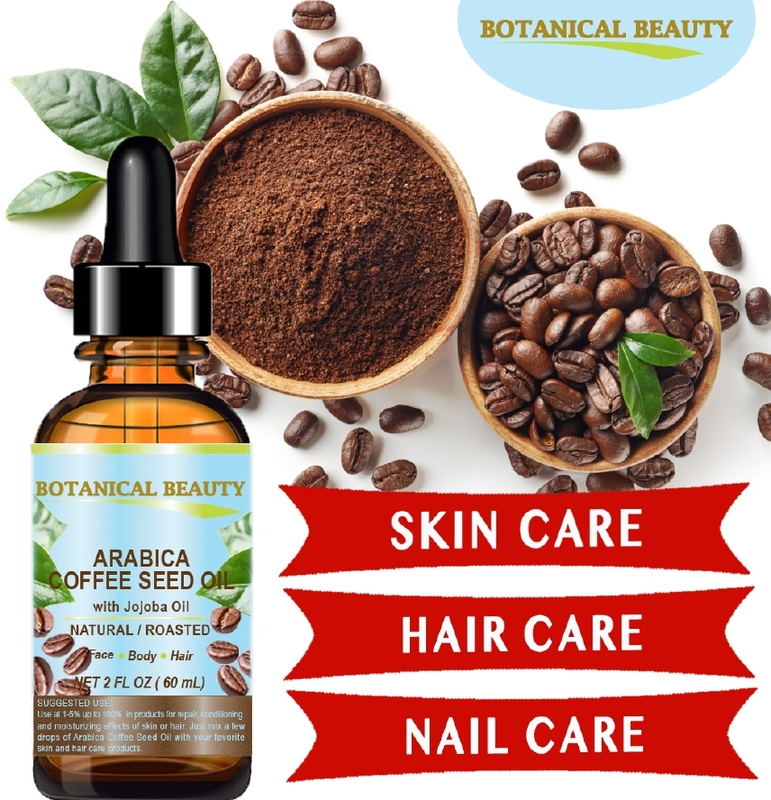 Botanical Beauty Arabica Coffee Seed Oil Roasted is rich in phytosterols that promote excellent moisture retention, quick penetration and good adherence within cosmetic applications. It is also exceptionally high in its composition of essential fatty acid, that helps restore skin's own elasticity and tone. YOU WILL LOVE THIS OIL. FOR FACE: A few drops are sufficient to apply on the whole face. It is usually applied at night as a moisturizing agent. It is non-greasy and non-oily and absorbs into the skin very easily and does not leave an oily feel. FOR HAIR: Gently massage and rub the oil on the scalp. Or Add 2-3 drops to your own favorite shampoo or conditioner. It gives the hair freshness, brilliance, and luster. This oil is absorbed very easily by the skin and the scalp and helps the cells to rejuvenate. FOR FACE & BODY: Just mix a few drops with your favorite cream, lotion, make-up remover, shower & bath gel, shampoos, face mask, sunscreen products, and various lip balms. You will love this oil. Arabica Coffee Seed Oil and Jojoba Oil, 100 % Pure/ Natural. Arabica Coffee Seed Oil comes directly from Brazil. Arabica Coffee Seed Oil is 100 PURE UNREFINED with no chemicals or synthetic solvents. No fillers, additives or artificial fragrances added. Non toxic, does not clog the pores. Absorbs quickly, leaving a light, non-greasy feeling. DOES NOT CONTAIN ANY PRESERVATIVES. Arabica Coffee Seed Oil is to be used topically only! Not for internal use. GREEN ARABICA COFFEE OIL Brazilian 100% Pure 1 Fl.oz- 30 ml. GREEN ARABICA COFFEE OIL Brazilian 100% Pure 0.33 Fl.oz- 10 ml. ARABICA COFFEE SEED OIL 100% Natural 2 Fl.oz- 60 ml. 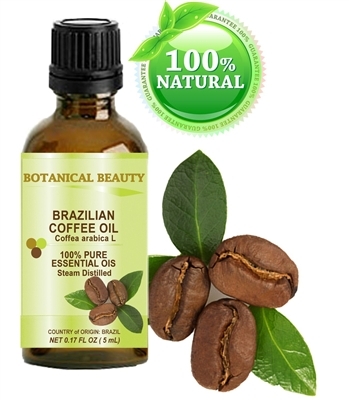 COFFEE Essential Oil Brazilian 100% Pure 0.17 Fl.oz - 5 ml. 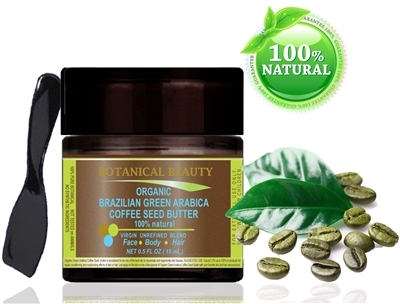 GREEN ARABICA COFFEE SEED BUTTER ORGANIC Brazilian 100 % Natural / 100% PURE BOTANICALS 4 Fl.oz - 120 ml. ARABICA COFFEE BEAN OIL Brazilian 100% Pure ROASTED 1 Fl.oz- 30 ml. ARABICA COFFEE SEED BUTTER 100 % Natural 4 Fl.oz.- 120 ml. ARABICA COFFEE BEAN OiL BUTTER 100 % Natural 2 Fl. oz. - 60 ml.